CalTrout released the first-ever comprehensive report chronicling the status of each of California’s native fish species (salmon, steelhead, and trout). 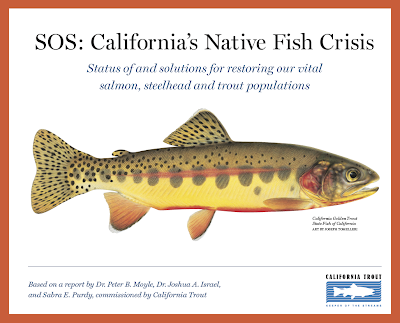 SOS: California’s Native Fish Crisis was written and researched by Dr. Peter Moyle, UC Davis professor and renowned expert on California’s water systems and the fish that inhabit them. The report’s findings indicate that the state’s native salmonids are in unprecedented decline and are teetering towards the brink of extinction – an alarm bell that signals the deteriorating health of the state’s rivers and streams that provide drinking water to millions of Californians. • If present trends continue, 65% of native salmon, steelhead, and trout species will be extinct within 100 years. • Sixty-five percent of the species headed towards extinction are found only in California. • Of the state’s 22 anadromous fish species (which spawn in freshwater and live most of their adult lives in the ocean), 59% are in danger of extinction. • Of the state’s nine living native inland fish, 78% are in danger of extinction. Santa Maria, Santa Ynez, Ventura and Santa Clara Rivers. 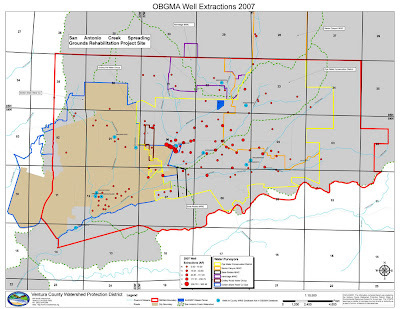 passage to spawning and rearing areas are critically needed. Ongoing research and restoration efforts have shown that when flows are reinstated, migration barriers removed, and cool, clean, abundant water provided, our native fish show signs of recovery. 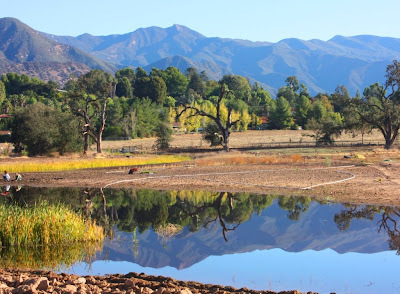 For the past several years, a collabarative effort led by the Ojai Valley Land Conservancy has been slowly restoring a historic wetland in the heart of the Ojai Valley. 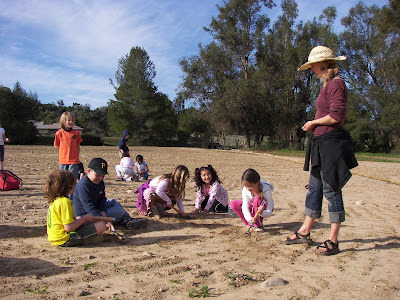 Many of you have seen and perhaps participated in the activities on the Ojai Meadows Preserve. 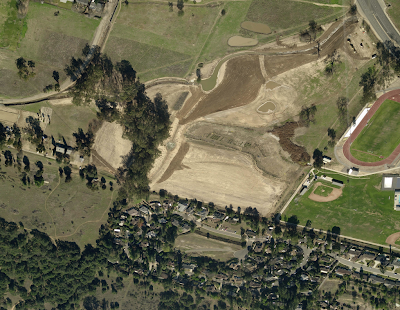 Earthmoving & construction were completed in April 2008 and major planting efforts will continue for several years. Ecological benefits include increased wildlife habitat, improved water & habitat quality, and increased aesthetic beauty. This little publicized effort is making a real difference in our watershed. Alleviated HWY 33 flooding by transforming Maricopa Drain from a straight, undersized man-made ditch into “Maricopa Creek,” a wider/deeper natural meandering stream with gently-sloped streambanks conducive to riparian vegetation establishment. Widening and meandering the stream required the removal of up to 90 eucalyptus trees. Created an additional meandering (Taormina) streamcourse, lined with 50 sycamores, 50 black cottonwoods, and native understory. Significantly decreased the non-native plant cover and increased the percent-cover of native riparian, wetland, oak woodland, savannah grassland, and sage scrub habitats, the bulk of which are now protected within a newly-erected wooden post & rail fence. Approximately one-third of the preserve is undergoing varying levels of restoration. 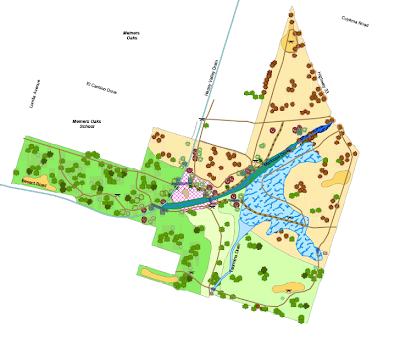 The overall “Ojai Meadows Preserve Habitat Restoration & Flood Control Plan,” prepared by Condor Environmental Planning Services, Inc., is being managed and implemented by OVLC staff, Coastal (ecological) Restoration Consultants, public and private schools, and volunteers of all ages. 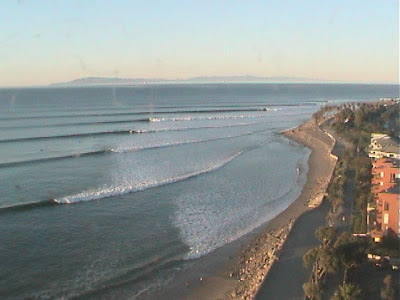 It's often hard to imagine that this long period groundswell originated with winter storms blowing off Siberia, over Japan, and into the North Pacific Ocean. Press Release: Ventura , CA (February 17, 2009). The Ventura Hillsides Conservancy is the recipient of a second donation of land to add to its conservation holdings. The gift came from the Gene Wave Waldo Trust. The two contiguous parcels comprising the gift measure just under one acre, and are located along the Ventura River just west of the Ventura River Trail. The property is south of Foster Park . The children of Gene Waldo, Wave Lee Stonerock, Nipomo; Jennifer Tidwell Kennedy, Casitas Springs; Robert Waldo of Medford , Oregon ; and Sue Brax of Lancaster donated the scenic riverside property in honor of their mother. The family chose to give the acreage to the local land trust to ensure that it would remain as open space in perpetuity. “We wanted to be certain that nothing would be built there” said Stonerock. 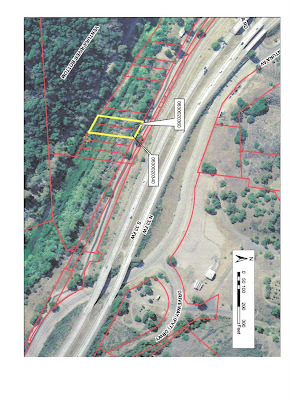 Kennedy added that she was pleased to give the lush riparian area to the Conservancy because “now the land has a purpose.” Pursuant to wishes of the donors, the grant deed carries a restriction limiting use to conservation objectives. The two parcels are remnants of larger lots that once fronted Ventura Avenue , and were created from the old Rancho Santa Ana subdivision. As children, the sisters recall coming up from the Los Angeles area on weekends to visit their Grandparents, Charles and Wave Hoffman. Charlie was known for many years as the sage of Foster Park . He owned an antique store on one of the parcels. Later, their mother owned The Green Door antique shop on the adjacent parcel. The children have fond memories of the playing in the river and the watching the train that ran behind their grandfather’s property. The train track is now removed and replaced with the Ventura River Trail. 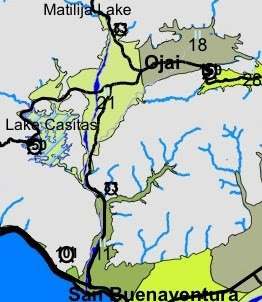 When the state built the Ojai 33 Freeway in the 1960s, much of the Waldo property and adjacent properties were taken through eminent domain, leaving a string of remnant parcels along the riverside west of the Caltrans right of way. The two remnant parcels remained in the family’s ownership since that time. The Conservancy hopes the Waldo Trust donation will inspire other landowners along the river to participate in the vision for the parkway. “Often what is considered remnant land in difficult floodplain setting actually has high conservation value and positive benefits as conserved land for habitat protection and public access to the river” says King. About the Ventura Hillsides Conservancy. The Ventura Hillsides Conservancy is dedicated to permanently preserving the hillsides, canyons and open space that contribute to the unique character and natural environment of the Ventura region. VHC works with landowners to help identify a property’s conservation value. Landowners can then work with their advisors to evaluate conservation scenarios and potential incentives that fit the property and the family’s needs. Donations to the Conservancy are tax-deductible to the extent allowed by law. Further information about the Conservancy log is available on the web site at www.venturahillsides.org, or by calling 805 643-8044. 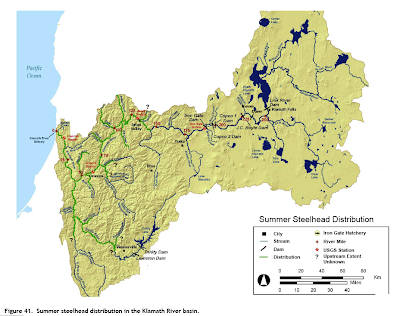 "our studies show that impacts of releasing the millions of tons of fine sediment stored behind the dams will be relatively short-lived and will not likely eradicate any species"
At a workshop convened in Ventura in 2002, a fisheries manager even used the term 'total biological annihilation' to describe the potential downstream effects of uncontrolled large scale sediment releases, and suggested this would be acceptable considering the long-term rebound of a migratory steelhead population. At the SRF conference last year, the removal of Marmot Dam was presented as one of the first opportunities to see the results of sediment release on a large scale. In that case the river naturally sorted the sediment and salmon quickly returned up the river. The final feasibility study for Matilija Dam outlined a controlled release of sediment, engineered to avoid impacts to surface water diversions, as the preferred alternative. However, project managers are now shying away from any release of sediment, instead favoring permanent storage of 2 million cubic yards of fine sediments slurried downstream. 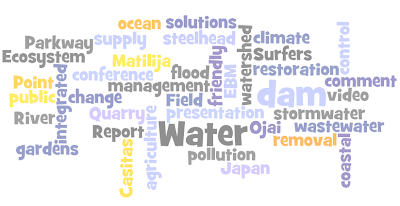 A similar tact is expected when engineering for upstream sediment management begins. 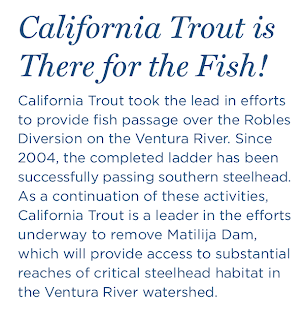 These issues and the dismantling of an open dialog threaten to stall the removal of Matilija Dam. There is a growing opportunity as more and more local groups begin to form around climate change. In the Ventura bioregion we have seen the Ojai Green Coalition and VCCool generate a renewed interest in local activism. Even the kids are getting organized. Aligning all this energy, and getting these latent activists up to speed is the first challenge. The next is finding ways to put EVERYONE to work on solving the looming crisis, which is actually the convergence of several crises all at once. Thomas L. Friedman’s phenomenal number-one bestseller The World Is Flat has helped millions of readers to see the world in a new way. 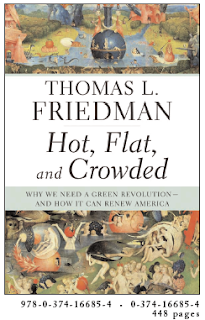 In his brilliant, essential new book, Friedman takes a fresh and provocative look at two of the biggest challenges we face today: America’s surprising loss of focus and national purpose since 9/11; and the global environmental crisis, which is affecting everything from food to fuel to forests. In this groundbreaking account of where we stand now, he shows us how the solutions to these two big problems are linked--how we can restore the world and revive America at the same time. Friedman explains how global warming, rapidly growing populations, and the astonishing expansion of the world’s middle class through globalization have produced a planet that is “hot, flat, and crowded.” Already the earth is being affected in ways that threaten to make it dangerously unstable. In just a few years, it will be too late to fix things--unless the United States steps up now and takes the lead in a worldwide effort to replace our wasteful, inefficient energy practices with a strategy for clean energy, energy efficiency, and conservation that Friedman calls Code Green. 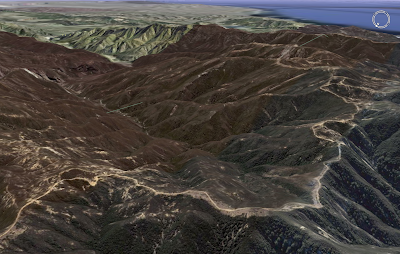 Old Man Mountain is a landmark on the ridge separating Ventura County and Santa Barbara County. The weather gauges on this 5400' mountain often record the highest rainfall in southern California. 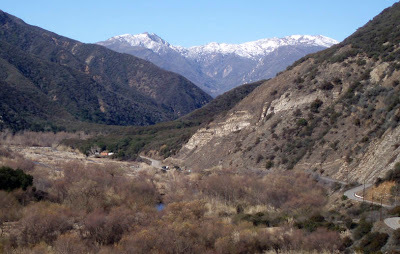 Matilija Canyon drains from this high ridge down to its confluence with the North Fork Matilija Creek, marking the headwaters of the Ventura River. This unique view is accessed either through a long climb up from Murietta Divide, or the even longer ridge traverse from the trailhead at Pine Mountain summit off Highway 33. We took the latter route, a 30 mile ride back to the highway. According to an article in the Ojai Valley News, the current drought and new water pricing is creating tension between water agencies and farmers. When wells run dry, growers have become accustomed to subsidized water imported from Lake Casitas. But with rate increases intended to cover the true cost of water, a local water district is reaching economic limits. Lack of integrated management between multiple water districts, municipalities, private well owners, and public agencies has resulted in over-allocation of the limited ground water basins and ongoing conflicts over current and future water use. And as the creeks dry up, ecosystem function is impaired by diminished surface flows and degraded water quality. Meanwhile, the statewide drought continues to worsen. The Central Valley Project, which provides irrigation water to central valley farmers, may have ZERO water this year. And water rationing is being considered for the majority of Ventura County which relies on imports from the State Water Project.